This was a sad week this week, as we lost one of our ducklings, we found it drowned on Thursday morning, which was not a very pleasant way to start the day. Somehow it managed to get into a bucket of water, that it was not able to get out of. We were aware that water can be dangerous for small ducklings, as they don't have all their feathers yet and find it hard to get out of some water areas. 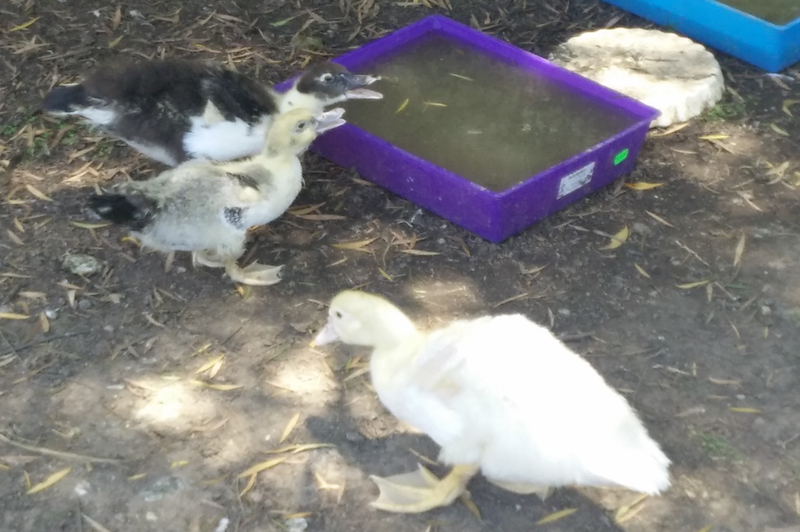 I had noticed on Wednesday afternoon, that the old ducklings (about 5 weeks old) - were now able to just reach into the large buckets of water and start drinking from there. So we were very surprised to find one stuck inside the bucket the next morning. We can not determine how since they were only just able to reach in - they were able to get totally in the bucket. We are presuming that it must have jumped and fell in and just managed to get it just right to accidently fall into the bucket. Due to the heat at the moment, and how clumsy ducks are we have about 15 different water containers for the ducks in the yard, we are careful with the water levels and height of the sides of the containers so that ducks don't drown. I now empty the bucket out when I do the last night check on the ducks and put the bucket upside down, so that no more of the ducklings can accidently fall in there at night time. On Friday morning, we planned that we would sell some of the small ducklings, as we had too many of them here 22 ducklings in total, 11 who were 5 weeks old from Krystal, and 10 from Thistle who where 3 weeks old. We were going to sell 6 of the three week old ducklings to Brookfield Produce, this too was a slightly sad event, as we would never be seeing these ducklings again. 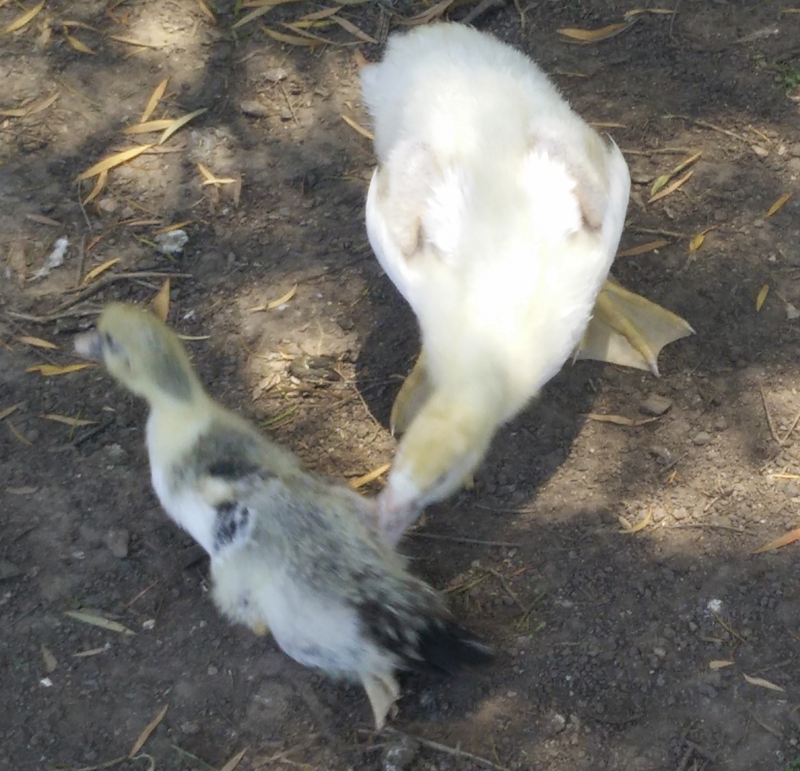 It was a stress full time for all concerned, the mother duck, was not happy, the ducklings were scared, as I was chasing them around and trying to capture them, and I was feeling bad, scaring the ducks. I also managed to get a few small scratches on my hands from grabbing the ducklings. We then transported the ducklings in two boxes and transferred them to a cage, at the shop. This would be the first time that they were not on grass and only had duck mash to eat. It was a sad feeling standing there watching them get used to their new home, as all six of them clustered in the corner I was going to take a photo of them for this post, but decided against it. Thistle now has four ducklings left, we did this deliberately as we thought it would be cruel to take away all of her ducklings, especially since we are planning on keeping all of the older ones for the next few months. We have noticed that one of the older ducklings is noticeably smaller than all the other ducklings, of the same age. The ducklings are started to get quiet large now and we can start to estimate which ones are male and females. A Muscovy Drake (male) duck will end up about twice the size of the Muscovy duck (female). The Bottom picture shows what we think is a male duckling, and the duckling that we are worried about the size of. You can see from the image how much smaller one is than the other. From this batch of ducklings, there is only one, and the first of any duckling that we have had that is a mixture of very small section of black and white - creating a grey effect, whereas all the other ducklings have been large areas or black and large areas of white. The younger ducklings of which we have the 4 left, there is only 'grey' duckling in there as well, and he seems to be a bit smaller as well, although it is hard to tell at this stage. We are not sure if this duckling is just the Runt of the litter, or if there is something 'genetic' about ducks with that coloring. We will be keeping an eye on the ducklings and see what happens over time and hope that he continues to grow. We also keep a closer eye on this one at feeding time to make sure that he is not kept away from the food.